A total slouch--that's what I've been on Marvelous Middle Grade Monday. After all, I don't have the Don breathing down my neck as "blog editor-in-chief," the kids are out of school for the summer and busy booby-trapping the back yard, and what little time I have for "me" is usually spent wrangling with the interminable work-in-progress. 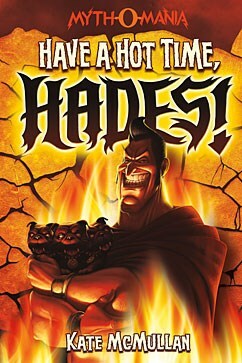 That's why, at a delightful 158 pages, Have a Hot Time, Hades was so easy to pick up. Add to this the fact that I've been in love with Greek mythology since at least the 3rd grade, and it all ended up as a splendid summer read for the too-busy blogger. What it's about: (from the Capstone site) Think you know the real story behind the Greek myths? Think again. Most people only know what Zeus wants them to. But the truth is, Zeus is a total myth-o-maniac. Hades, King of the Underworld, is here to set the record straight on how he ended up as Ruler of the Underworld and Zeus became King of the Gods. Opening Lines: "Call me Hades. My full name--His Royal Lowness, Lord of the Dead, King Hades--is a bit of a mouthful. Why I liked it: VOICE--Hades's narrative has this in spades. The conceit--that Zeus is a cowardly braggart--and that Hades saves him all the time, without any credit, is executed with a great deal of panache. Pacing: This is a fast and fun read, Writers, if you want to study how to construct a fast-paced narrative, this would be a good one to study. Humor: Spot on for the target audience, which I figure would be 8-12 year olds. Here's an example, as the three brother gods approach the Underworld. (Po is Poseidon). "This must be the River Styx," I said. Mom told me about it. ""You mean the River Stinks," said Po."Pee-yew!" Zeus agreed.The smell was strong, but to me it just smelled like an old auntie who'd put on too much perfume. The good news is that there are seven more titles in the series, with a new one coming out this year. I'm looking forward to reading them all!! I'll be contacting you soon, Akoss! As for what I was doing for most of the past two weeks: watching Britain's 77 year drought of men's Wimbledon's single's champions come to an end with the sterling victory of Andy Murray. So proud and happy! I feel bad not only because I'm not posting much, but especially because I'm not being a very good pal and visiting you guys' blogs. And I miss you. I am going to make a concerted effort to do a better job from this day forth. After all, July's a good month for new resolutions, isn't it? If you have a moment to spare, check out my review of author and agent Anna Olswanger's powerful short novel about the Holocaust, which is over at Project Mayhem today. And thanks for being such patient and long-suffering blog pals.